Fire crews are continuing to work on containing the Shovel Lake wildfire that has grown to just under 80-thousand hectares in size. Crews will be able to send in planes to dump water on the wildfire because visibility from the smoke has cleared up. 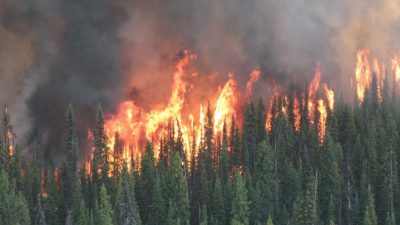 Kevin Skrepnek with the BC Wildfire Service says there has been growth but it’s not a bad thing. There are currently 556 wildfires burning in the province with 22 starting yesterday and 50 of note. The cost of the wildfire is estimated at $242 million.